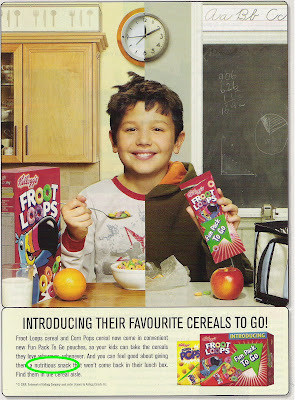 Cause nothing says "nutritious" like Fruit Loops and Corn Pops! "And you can feel good about giving them a nutritious snack"
Perhaps when compared with a bag of pure white table sugar. Speaking of a comparison with pure white table sugar....44% of the calories of each "loop" comes from pure white table sugar. What could be more nutritious than sugar?